Image 1. 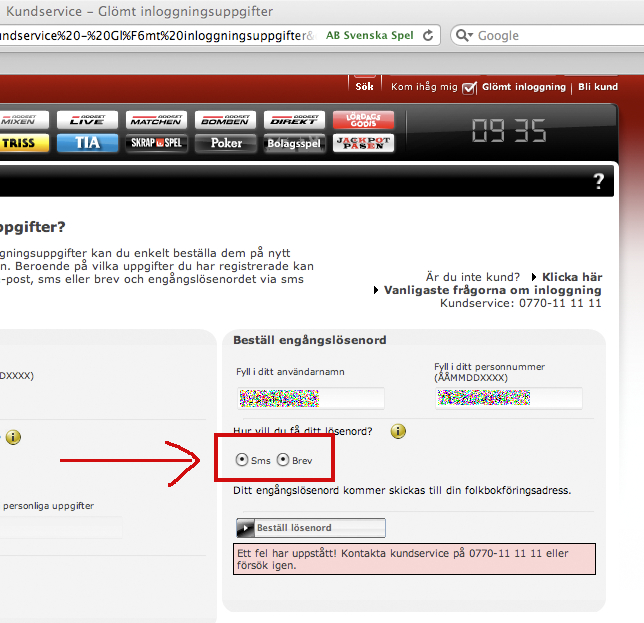 Svenska Spel’s retrieve password page. I haven’t played on svenskaspel.se for a year so I can’t remember my password. Therefor I went to the site to get a new password. This was easier said than done. On the “Retrieve new password” page you have to fill out your username and birth date and then select the delivery format. I selected “in the mail” since I haven’t the same mobile number as I did when I signed up at Svenska Spel. But when I clicked on the “Mail” radio button the “SMS” radio button was still selected. In fact both of them were. This generated an error when I sent my request asking me to contact customer support. About 4% use Safari as their browser (I am not sure how the statistics are for Svenska Spel) so the browser should absolutely be among the ones doing functional tests on. After trying a couple of times I thought “hmmm…. I wonder if it works in a different browser?” so I started my Firefox browser and it worked perfectly there, so now a new password is on the way to my home. It’s important to test basic functionality in many different browsers so players will be able play!